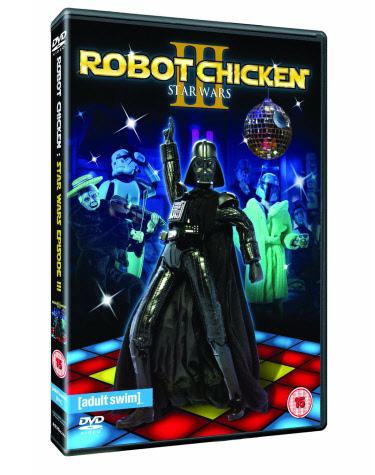 Having enjoyed a lot of the previous Robot Chicken series and spoofs I was looking forward to this new DVD. Released on July 4th 2011 it is available to buy in all good DVD stores, and of course, some rubbish ones as well. Amazon have it in stock at the time of writing. But is it any good? Right from the start it is clear it carrys on the Robot Chicken style in exactly the same way as it has been previously. This time though the story is a bit different, as they just go all out and spoof the entire Star Wars franchise! With a depth of characters appearing throughout. The sketches are as you expect, short, punchy and funny, some only a few seconds long will still make you laugh out loud. The production of this episode feels even better to me then previous ones, they may have changed nothing, but for some reason it feels slightly more polished perhaps. For me overall it is a little bit better then the previous 2 episodes, which says something given how good they were. And this one is an hour long, so more to enjoy then previously, great considering it is stop motion production. Hence forth you shall be known as Darth Vader. Thank you my master…. Hey before you go, my face is really warm, is everything ok up here?! Clean up on isle my shorts! As with previous DVDs you also get a good set of extras to sift through, including deleted scenes, trailers, commentaries, gag reel and interviews with Seth Green and the other guys behind the production. The show still only has somewhat a cult following, and I believe it should get more credit then it does. If you’re a fan this is another one to make sure you watch. Released on July 4th 2011 you can order it now.